Among the many miracles of healing attributed to Padre Pio, some are so unusual and unique that they have been the subject of much discussion and controversy. In these particular cases, the person who has been healed lives a completely normal life afterward, even though they continue to have all the physical symptoms of their illness. From a scientific viewpoint, they are still sick. One such person is Gemma di Giorgi. Gemma di Giorgi was born on Christmas day in 1939, in the Sicilian town of Ribera. Almost immediately, her mother realized that her eyes were different from other children’s eyes. The truth was, Gemma was blind. Her mother took her to a doctor who was unable to determine the gravity of her condition. She was referred to two specialists in Palermo. They determined that Gemma had no pupils in her eyes; that nothing could be done for her blindness; that her condition was inoperable. Gemma’s family was desperate, but there was nothing they could do. 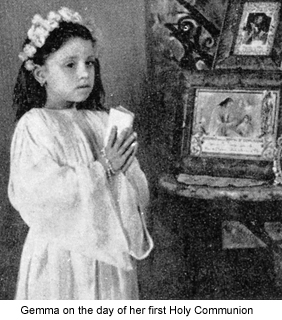 Her parents often took her to Mary’s altar in the church to pray because they felt it would take a miracle to heal her eyes. A relative who was a nun, advised the family to seek out Padre Pio. Her advice gave the family a ray of hope. Gemma’s grandmother asked the nun to write a letter to Padre Pio on Gemma’s behalf. The nun was struck by the coincidence of the dream and the letter that followed so she wrote to the family and encouraged them to take Gemma to see Padre Pio. And so it was, that in 1947, the grandmother took 7 year old Gemma to San Giovanni Rotondo to see Padre Pio, praying and hoping all the while for a miracle. On the trip from Sicily to San Giovanni Rotondo, Gemma’s eyesight began mysteriously functioning. The grandmother was upset that Gemma had forgotten to ask Padre Pio for the grace of a healing while she was in the confessional and so she began to cry. Gemma became upset also and began to cry. The grandmother went to confession to Padre Pio and in her own words, “I asked the grace for Gemma and I told Padre Pio that Gemma was weeping because, in her confession with him she had forgotten to ask this grace. I will never forget his soft and tender voice as he answered me with these words, “Do you have faith, my daughter? The child must not weep and neither must you for the child sees, and you know she sees.” I understood then that Padre Pio was alluding to the sea and the ship Gemma had seen during the trip and that God had used Padre Pio to break through the darkness that covered Gemma’s eyes.” The same day, Padre Pio gave Gemma her first Holy Communion and again made the sign of the cross over each of her eyes. When Gemma returned to Sicily her eyes were again examined by a specialist. The doctor, to test Gemma, held up various objects in front of her and she was able to see each one of them. She was able to count the doctor’s fingers at a distance of sixteen feet. Gemma, even though without pupils, had her eyesight; she could see. The doctor declared that Gemma’s eyes were in no condition to see. There was no medical explanation for it. Many doctors from all over Italy requested to examine Gemma’s eyes. This extraordinary cure, and the prophecy preceding it, aroused enormous interest in the Italian press during the summer of 1947. Gemma’s sight continued to improve and she was able to go to school and learn how to read and write. She was able to lead a perfectly normal life. 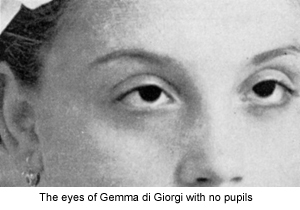 While the doctors could not all come to a consensus on the subject of Gemma di Giorgi’s medical condition, the facts that can be definitely established are these: (1) Gemma di Giorgi was born with a severe congenital defect of the eyes; (2) before the prayers of Padre Pio were enlisted, her vision was either quite defective or altogether nonexistent; and (3) afterward, though the physical structure of her eyes remained unchanged, Gemma was able to see normally–even though officially classified as legally blind. So what must the conclusion be? Simply that while Gemma and her grandmother were traveling to San Giovanni Rotondo to ask for healing grace, the grace came to them through the intercession of Padre Pio’s prayers before they had even arrived at their destination. God, for His own mysterious reasons, had wanted it to happen this way. Gemma has since traveled the world telling her story.